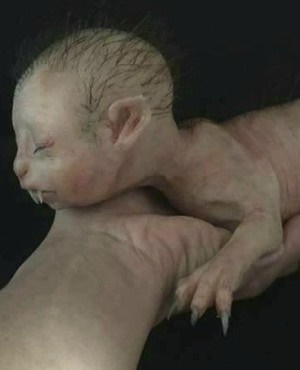 WATCH: Is this bizarre creature a kid, cat or werewolf? Police are calling this photo a fake but some believe this apparition is a living, breathing creature behind held captive in a laboratory in Malaysia. At first glance the pointed ears, tufts of hair and long eyelashes remind you of a human baby – until you see the fangs, claws and long tail. Datuk Rosli Adbul Rahman, the Malaysian state police head, described the photos, which are making waves online, as a hoax. He’s fed up with theories about the origin of the photographs and says they originated on the internet. The creature is apparently a baby wolf made of silicon being sold as a toy on a foreign website. In the meantime social media is abuzz with rumours that this little thing is being held at a secret laboratory in Pahang, Malaysia. Conspiracy theorists, eat your hearts out.